The JDog Foundation’s goal is to donate to organizations dedicated to improving the everyday lives of Veterans. To be a nationally recognized force in supporting Veterans and Veteran-related causes – with a particular focus on stimulating Veteran entrepreneurship and Veteran employment. The JDog Foundation is guided by the principles of JDog Franchises LLC – Respect, Integrity, Trust. Our mission is to develop and implement programs and services that support Veterans and Veteran-related groups, and to provide funding and related assistance to individuals and organizations that provide benefits to Veterans. 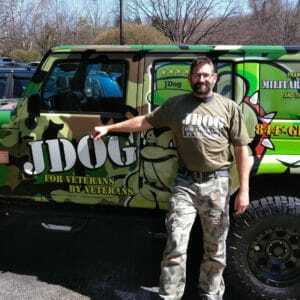 In 2018, The JDog Foundation donated equally to five different Veteran scholarship funds. A portion of all revenues and proceeds from the JDog television series and JDog television merchandise will be donated to the JDog Foundation (501c3). The Baugher Initiative was inspired by former Marine Corps SSgt and current JDog franchise owner, Rob Baugher and family with support from the JDog Foundation, in honoring the men who fought and served alongside him but would never come home. We want to honor their selflessness, dedication and ultimate sacrifice by carrying on their strength, character and stories, along with all the post 9/11 fallen heroes. Learn about the unique assets and backgrounds the leadership team brings to the JDog Foundation and how they support our mission. We treat people as they should be treated, and respect is seen throughout all our interactions with our customers, our employees, our peers, and our community. We have a strong moral compass and believe that working with integrity is the only way to conduct business and creating lasting relationships with each other and our customers. Our customers invite us into their homes and place their trust in us. We take this honor seriously and only conduct business in a manner that further establishes this relationship.